As a follow-up to Michelle's Sea Serpents in Maine, I offer "A Plea For a Monster," from the Harper's New Monthly Magazine of July 1860. Author Charles Nordhoff argues for the existence of sea serpents, and marshals as evidence several sightings made along the Maine coast. See also Rev. 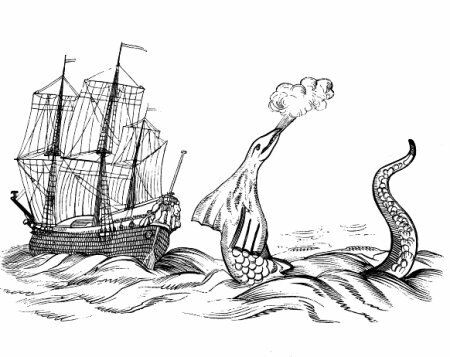 Abraham Cummings' description of a serpent witnessed in Penobscot Bay in 1809 [p. 183], an 1830 account from Kennebunk [p. 184], and all the great illustrations — mostly of ships confronted by serpents and giant squid. Well, not in Vassalboro, apparently! A local man named Kenneth Knox chased his brother-in-law around the house with an ax on Christmas Day, then threw gasoline on his sister and her computer, then on a woodstove which consequently erupted in flames. Why was Mr. Knox so upset? Well, because his brother-in-law had asked him to go outside to clean his chainsaw. Is it just me, or does this sound like something out of a surreal set-up? When apprehended by the police Knox was described by the sheriff as being "kind of distraught and uncooperative." Seen this morning on the WCSH-6 morning news. Story here. Press Herald article with more details here. Well I hope everyone had a good holiday. We here at The Hive made our way 5 hours north to Presque Isle to visit with Tristan's family up there. It was a good time though it did involve eating far too much in the way of cheese, potatoes, eggs and bread for us vegetarians. 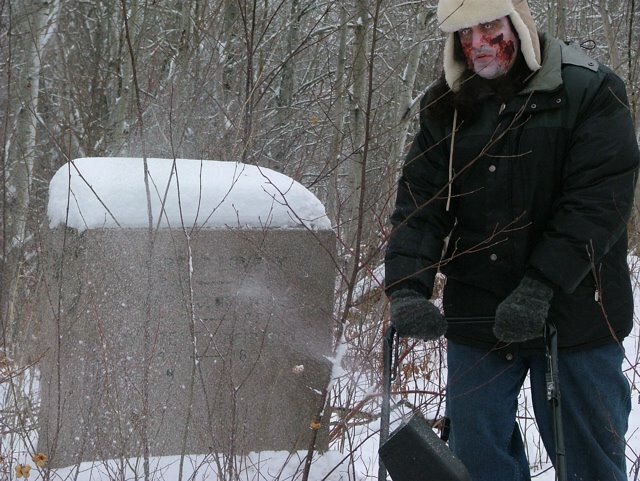 Christmas Eve morning we hooked up with Kris LeVasseur in Fort Fairfield and proceeded to spent the strangest holiday ever with him doing a photo shoot in a small graveyard behind his father's property. 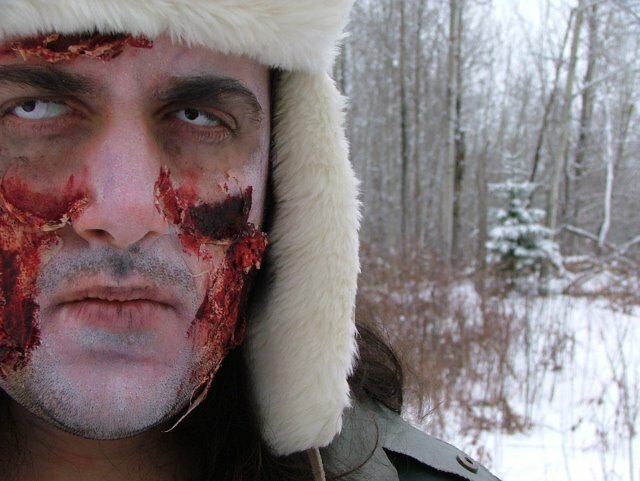 The photo shoot involved Tristan in full zombie makeup and full winter regalia (bomber hat, et al) snowblowing in the graveyard. How very ludicrous and wonderful. This seems to be the usual result of Kris finding willing participants for the things his brain cooks up. The graveyard was a bit of curiosity in and of itself. It is tucked off the main road in a sparsely wooded area, on a small hill overlooking rather watery land. The purity of the Northern Maine landscape in the winter is magnificent. The air was cold and still and grey-bright. 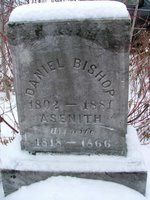 The graveyard is home to a small group of late 1800s graves. There are 5 or so upright stones, and a handful (I am told) of flat inset stones that were hidden by the snow. I took photos of all the uprights, including this one which is remarkable in that it hearkens back to H.P. Lovecraft's story "The Thing on the Doorstep." This take takes place in part in Maine, and the villainess in the story is named Asenath Waite. Asenath is a remarkable name, one which I have not heard in any context before or since reading the story. Yet here in a remote location in Maine I found a stone with the name Asenith inscribed on it. An interesting coincidence. I wonder if Lovecraft found this very graveyard in his taphophilic wanderings? A new fiction book about a modern-day middle class Maine werewolf is hitting the shelves. All Things Maine has the scoop. The AP reports the strange story of a man who was arrested in Maine on July 29, 2004, for trespassing on Martha Stewart's property. That man is one Joe Moretti, a 38-year old designer who actually lives in Rhode Island (he liked Martha enough to trek up to Maine?!). Apparently every year Moretti mounts a wild Christmas celebrity spectacle on his front lawn, setting his middle class neighborhood aglow. This year the theme is Paris Hilton. I could have made you guess that but you never would have figured it out of the blue. Ron Raffonelli, 65, said he would be upset if his young grandchildren came to associate Christmas with naked woman. He'd prefer the kids to think of Santa Claus instead.After all, Raffonelli said, "He's been around longer." A good idea, but his historical backing is a little off, unless we're speaking of the Santa-Who-Always-Was-Will-and-Shall-Be, some cosmic deity who precedes the evolution of the human race. Last year, he paid tribute to Martha Stewart even as he and another man faced charges for sneaking on to the domestic maven's property. The charges were later dismissed, and the men donated money to public libraries near the property. Moretti calls the incident a "big misunderstanding." Stewart's 61-acre estate is located in Seal Harbor and is known as Skyland. Moretti claimed he was invited onto the grounds by Stewart employees who later changed their mind. I just blogged at All Things Maine about a new website, New England Indies, that allows local indie filmmakers to post short films, trailers, music videos, etc. Clips are offered as Quicktime movies, and as free video podcasts. A woman from the future delivers the ultimate weapon — to a hapless video store clerk. Can he figure out the weapon, fight off the alien horde and get the cute girl’s phone number before the earth is destroyed? According to the Newborn Pictures website, Potelle and Rankin had only a $50 budget for They Came to Attack Us, but the short was picked up for broadcast by the Sci-Fi Channel two weeks after premiering in Portland. They went on to greater fame when they won the second Project Greenlight contest and were allowed to direct The Battle of Shaker Heights — a film noted for its lack of alien hordes. Hi everyone! Exciting news here at Strange Maine from Emptyhouse Film -- hot on the heels of their latest film Mud, writer/director Andy Davis is filming their next flick at the Stone House on the Wolf's Neck Preserve (officially the Wolfe's Neck State Park) in late January early February. Apply now if you want to be involved!!! The story is a great, atmospheric ghost story, focusing on a woman alone in the Maine winter. A modern day "victorian style" ghost story. The Stone House is now owned by USM and used primarily as a place to hold such events as the Stonecoast Writers' Conference. Wolfe's Neck State Park is a place of shore rocks and pine trees, very beautiful. A history of the house. Some photos on flickr.com by Netnerd of stone staircases at Wolfe's Neck State Park. 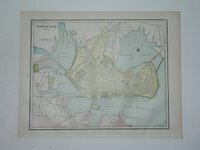 An extensive photo album of Wolfe's Neck State Park at billandkent.com. The Maine Department of Conservation site about the park. The FBI released almost 800 pages of documents regarding Wilhelm Reich recently, under the Freedom of Information Act (FOIA). Reich is well-known in many obscure circles for his pursuit of what many called strange research, from orgone treatment to an anti-gravity formula. For a sample of his involvement in these otherworldly avenues of interest, please see this recent article at Phenomena Magazine about Reich in the role of secret ally to Eisenhower in dealing with the Roswell alien episode in the 1950s. What does Reich have to do with Maine? Maine was his home for many of his later years, and now hosts his museum on the same 175-acre site near the Rangeley Lakes. "Since 1988, from July through August, the Trust has donated this cabin free of charge to adoptive, foster, and kinship children and their families who could not otherwise afford a summer camp experience as a family. Every summer eight families get to spend a week at Tamarack which offers quiet, seclusion, access to the shores of Dodge Pond with their own private dock, and the opportunity to be together in the beauty of the Rangeley Lakes region." Back at the beginning, there was a lively account of Chris D's distant relative, Dr. Valorus P. Coolidge, and his murder of the unfortunate Edward Mathews in Waterville, Maine. During the discussion, it was discovered that a murder ballad had been written about the event, and your humble servant undertook to retrieve a copy of said ballad through the magic of inter-library loan, as published in Olive Woolley Burt's American Murder Ballads and Their Stories. Poor Edward Mathews, where is he? And in his narrow bed he's laid. Or o'er his mangled body gloat. So black a deed of murder do? To be his nearest earthly friend. And watched each hour for his return. You swore within your heart to have. So that he could in safety rest. Alone into your office went. Our friendship here shall never end. With Prussic acid amply mixed. Then cried, 'O Lord! What can it be? After he was entirely dead. And all your doings did relate. And on the gallow I must die. And I have thumped him on the head. I wish the river were its bed. Will shield me from all harm and blame. His mangled, bruised, and dead body. And say let Coolidge be forgiven. 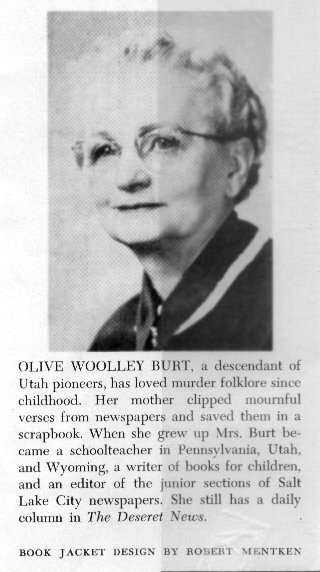 Burt herself is an interesting study in personality, as she has "loved murder folklore since childhood," when "her mother clipped mournful verses from newspapers and saved them in a scrapbook." 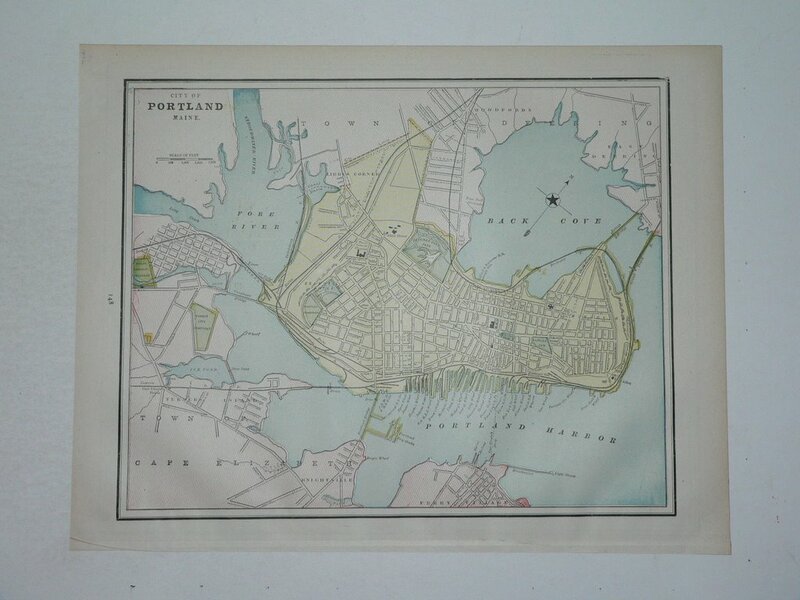 I have an old late-1800s Portland map up on my office wall. Today I finally got around to looking at it, and found some interesting stuff. For one thing, there used to be a wharf off of Commercial Street called Widgery Wharf. What a great name. Apparently, though I've never noticed a sign for it, it still exists. David Wade, a documentary photographer, did a photo essay on it in 2002. In his words: "I am particularly fascinated with one old wooden dock, one of the last remaining fish piers that hasn't fallen victim to either old age or recent residential and recreational development. Widgery Wharf is the oldest working wharf in Portland, built in 1774, two years before the signing of the Declaration of Independence. The wharf plane reeks and creaks of history, with its pilings worn to near nothing by centuries of sea worms, and those other holes where the molasses shed once stood. On moonless nights, boats would surreptitiously slide under the dock with hand augers, bore holes, siphon the rich black syrup into barrels, and slip into the darkness with their sweet plunder. The tanks are gone now, along with the downeast drillers for black gold. All that remains today is the lobstermen, but the memory perseveres among the old-timers whose shacks line the dock. "Collectively owned by five families of lobstermen, Widgery Wharf is a bastion of Yankee independence, a traditional fishery where men work for themselves, labor hard with their hands, and set out to sea in small craft to make their living. I was struck by the simplicity and directness of these fiercely independent lobstermen, who keep a tradition by hauling traps just as their fathers had before them." Source. I wonder if, in fact, Widgery is one of the wharves that I have wandered around on with my camera, beguilded as Wade is by the creak of the timbers and the age-old smell of salt. Another thing I noticed was the Portland Jail was tucked up on the East End, between Madison and Monroe Street, off of Washington Street (now Washington Avenue). Back Cove, even back then, sported "Base Ball Grounds", though they were over about a block from where they are now, right in back of my office, and Baxter Boulevard didn't exist. In fact, the Portland City Limits ended past the back end of Deering Oaks Park where the railroad tracks and interstate lie today. Anywhere past that line (which ran along Deering Street/Avenue up past Noyes Street and then along Douglas Street) became a part of the Town of Deering, for those of you who are always wondering why the neighborhood around Deering High School is called North Deering. I've run across a pamphlet published in 1937, written by "a couple of witches" — namely, Anne Mountfort and Katherine Marshall. It's called (in full) "Witch Trot Land : Being a bit about the Mother of Maine, York County, or Yorkshire, or New Somersetshire, from which ALL Maine counties came. Of her hopes and dreams and heartbreaks, and of the first incorporated English city in America. . . . . Credit is freely and gratefully given to everything we could lay our hands on — we had to — we weren't here in the 1600's." A 2003 article in The York Weekly references this work in recounting some York ghost stories. Good morning! Here are a few tidbits about my regular Friendly's restaurant, the one out by the Maine Mall in South Portland. 1. Their booth tables are coffin-shaped. I am totally serious. At least ours was. 2. They were singing "Yes we have no bananas, we have no bananas today" in the kitchen. 3. The fellow who seated us (the manager, maybe?) is, in fact, Joe Anderson, a guy who was in my freshman Earth Sciences class at Deering High School, as taught by the amazing Glen Black. Oh big deal, you say. Well, Joe forever stands out in my mind because at some point during freshman year he went to an Alice Cooper concert and came back the next day wearing his souvenir tour t-shirt covered in fake blood from when the usual Cooper mayhem erupted on stage. Joe Anderson will forever be cool, in my eyes, because of that. There was also an incident with a baggie full of oregano, but the details of that are a little fuzzy, perhaps because he kept changing his story. Portland's own deacons of underground conspiracy-theory based rock are back in town from San Franciso, on their "Expose the Truth" tour, playing tonight at legendary hotspot Geno's on Congress Street. The Vampire Lezbos are old favorites of the punk crowd, being founded appropriately in 1984, thank you George Orwell. "The LEZBOS are a SOCIO-POLITICAL BAND with lyrical content focusing on that of SUPPRESSED KNOWLEDGE and OPPRESION OF THE MASSES. What is it all about anyway? In no particular order: the extensive 'alien' presence on earth, known to most of the world's governments; time travel made possible in the 1940's; the earth being hollow(as are all planetary bodies, including the moon), and resided in; ...(snip huge chunk, go read it yourself if you like)... indoctrination disguised as education in our schools to produce apathetic consumers who perpetuate the system for the benefit of the few; the supressed knowledge that this universe is a subjective creation of our minds, and with that knowledge, can be changed...the list goes on. The bottom line being that we have all been lied to royally and with this information, society could finally know true liberation." They'll be opened for by Covered In Bees, the best in Portland's new rock blood, and Big Meat Hammer, who are descendants of such Portland underground luminaries as the Gore Hounds (personal favorites of mine). Don't miss it!!! "Some orb weavers are influential enough to make history. One such spider was the inspiration of E. B. White's Charlotte's Web. Charlotte, who spun her webs in Maine, was an Araneus cavaticus, sometimes called a "Barn Spider". (NOTE: Not all barn spiders are A. cavaticus; there are several species of spiders that are commonly called barn spiders.)" While you're on their site, be sure to look at the photos of some of the crazy-looking variations of the breed. Some are quite scary looking, though harmless. Maine has an interesting variety of buggity-boos, and recent rumors include statements from Olive Garden staff members about black widows arriving in tomato shipments, replete with warning notices for employees to be on the lookout. Other establishments have had similar problems, from all reports. Ahhh, I love a good rumor. Also, I love spiders, scary or not. They eat up a lot of the other insects that are far more pesky. This past summer seems to have been a bumper one for our arachnid neighbors. There were more webs strung around my apartment building, including across stairways and between cars and the side of the house, than I have ever seen before, and they were BIGGER than I've ever seen before, as were the grey and brown fuzzy eight-leggers that were astride them, and stronger (which can be an issue when it's 2 in the morning and you find a web wrapped around your face).